The DurbanGeek ~ IT Solutions: Why does my Computer Boot-up so Slow? Why does my Computer Boot-up so Slow? 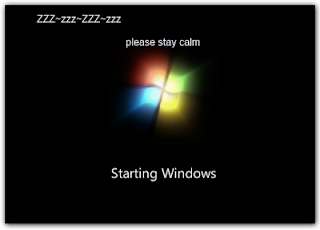 Are you getting frustrated with your PC - taking forever to start up. Ask anyone who has needed to get on their PC in a rush, only to wait seconds and minutes too long for their PC to start up. If you’re still dreaming about an instant boot PC, but living with the reality of a slow computer and a slow boot time, don’t despair. There are many reasons to blame for a slow PC boot: background apps, virus / malware scan, HDD problems. Read on to get your PC boot process explained and learn how to shorten a long boot time by selecting which apps should and should not run in your computer start-up. Why does my computer boot-up slow? A number of factors play a role in slowing down your PC’s start-up – the age of a PC, battery health, antivirus, an outdated or hard drive with problems can all cause a PC’s boot time to be slow. One of the biggest issues in causing a slow PC boot is the number of computer programs and apps that start during boot. If too many apps are starting during the boot it can add seconds and even minutes to the time it takes for your computer to turn on. In order to speed up boot time it is very important to remove apps or programs, that are not necessary for your computer to start from boot. To do this you can run Msconfig and remove the programs or apps from starting up. If you are not familiar with using Msconfig you can download and install a program called Ccleaner which is easier to use. See below in Start-up Programs, I will explain how to use both Msconfig or Ccleaner in an article linked there, but before I do that there are also other factors to look at. How can I speed up my PC’s boot time? Hard Drive: If your hard drive has been slowing down your PC, a simple hard drive cleanup, or a “checkdisk” can solve problems and get things started faster. An SSD (solid state drive) is the way to go if you’re willing to make an investment – it speeds up your computer considerably. Ram: A computer slow down, including a slow boot, might be due to the fact that your computer simply does not have enough RAM. Adding RAM can help to take time off your boot for a faster computer start.